"JELLYFISH IN B.C. AND AROUND THE WORLD WITH LUCAS BROTZ"
Jellyfish populations are increasing in numerous ecosystems around the globe. Not surprisingly, these increases are not uniform in time and space. 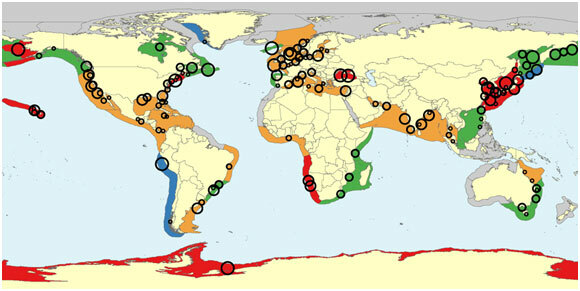 So why are jellyfish increasing in some places and not others? What are the consequences for humans and ecosystems? Are we seeing similar changes in local waters? 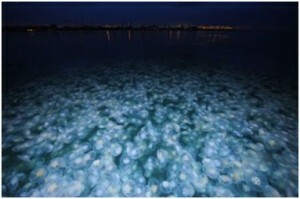 And what, if anything, can we do to manage or prevent increasing jellyfish blooms? Lucas Brotz dives with a lion's mane jellyfish (Cyanea capillata) in Indian Arm, BC. (Credit: Conor McCracken). 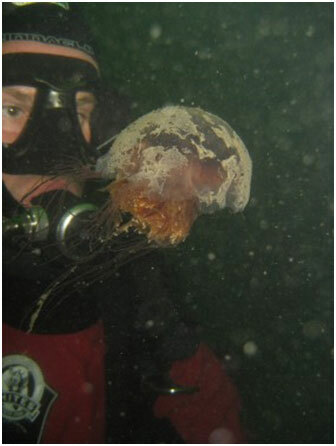 Join jellyfish researcher and UBC PhD student Lucas Brotz on March 4, 2014, as he discusses the answers to these and other pressing questions with the Sea Kayak Association of BC. Learn about giant jellyfish in Japan, deadly jellies in Australia, and many of the species you are likely to see closer to home. Do you know what to do if a jellyfish stings you? Be there on March 4th to find out. Doors open at 7pm at the Vancouver Museum, meeting starts at 7:30, public welcome! Red: increase (high certainty); orange: increase (low certainty); green stable/variable; blue decrease, grey: no data. Circles represent jellyfish populations with relative sizes reflecting confidence in the data. (Brotz et al, Hydrobiologia).